A talented painter, photographer, mum of two and wife to one, the driving force behind our community hub, Sammy absolutely pours her heart and soul into creating a warm, welcoming space for creatives and our wider community. She has a very close relationship with her family despite some serious mileage between them and is particularly close to her Nana, who is 85 at the time of writing this. Her Nana spent a great deal of time with her when she was little, reading and drawing which her family says must be what sparked her creative mind and love of the arts. If you've ever had the pleasure of meeting Sammy, you immediately notice her gentle, humanitarian nature and worldly ways which are probably a result of her having ties to all four corners of the globe. She once told me that she knew and lived the absolute meaning of Whanau. To her, it is the way that our community accepts others and treats you as part of the family when her own are not near by. Sammy brings that meaning of Whanau to The Upstairs Gallery. When you walk into her gallery, straight away you feel that she's set on creating a place of inspiration and cultural immersion. She's committed to finding an array of emerging artists and makers of all ages and walks of life who create in so many mediums from ceramics, jewellery, carvings, painting, photography and more. 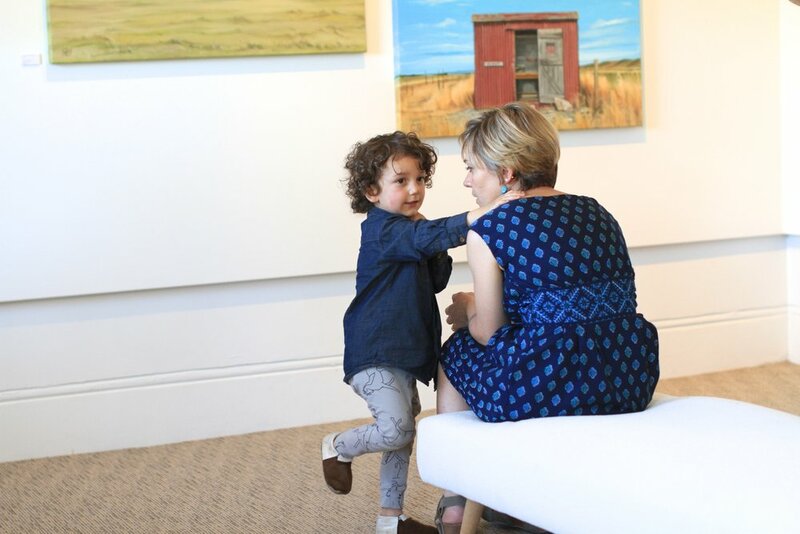 It's so plain to see she has a love and appreciation for it all and it's fast tracking Titirangi's quaint, community gallery to being a place everyone needs to see and hang out in, that's for sure! After hours you'll find her at home with her family, at the gym or painting - drawing inspiration from the gallery and reading autobiographies. She enjoys the occasional cheesecake (although if she offers to make one, I've heard it's best to stick with a Sara Lee's number after a frisbee like creation Sammy once made her niece Kelly) and she's currently reading The Diary of Frida Kahlo. I know Sammy believes in living a balanced life, so she will always strive to have a glass of wine in her other hand. Bio written by a friend of The Upstairs Gallery, with some help from Sammy's Mom, Karen Walker in accessing some of her earlier work which is currently in another corner of the globe.